Canberra Library Tribe – Providing informal fun events for Library & GLAM people in Canberra & surrounds (ACT, Australia). Thank you everyone for attending Rainbow Storytime last month! 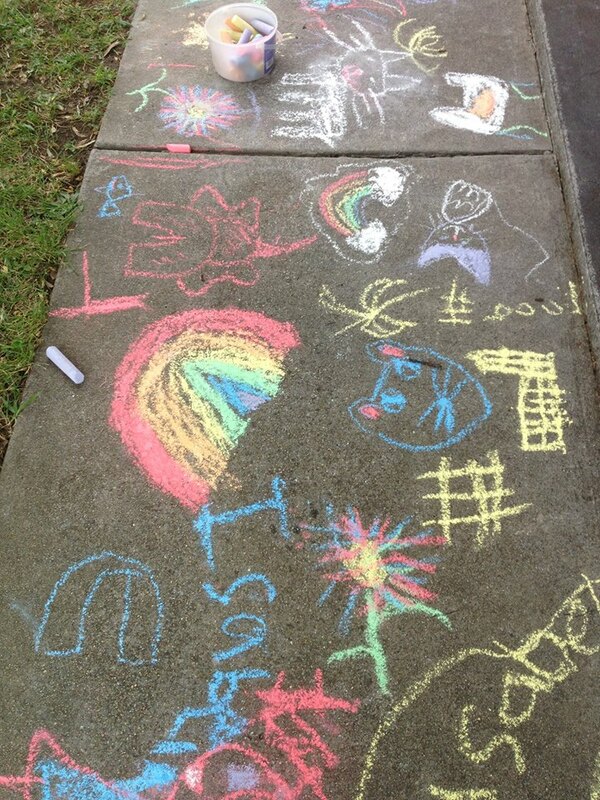 We had a lovely time and read lots of fabulous and joyful stories, rainbow chalk art, hula hooping and making giant bubbles. The playground was fun too! Big thanks to Diversity ACT for their venue and graceful hosting, to Veganarchy Baking for her vegan sausages and BBQ loan, and to all who shared on social media. Lots of glittery love to Carl at CMDphotographics who created our magnificent poster. We highly recommend Diversity ACT’s Diversity Hub as a venue for parties and events, do consider hiring them for your next ‘do! Their rates are ridiculously reasonable and all funds go towards their grassroots work in the LGBTIAQ+ community. You can donate to Diversity ACT at their site through paypal. 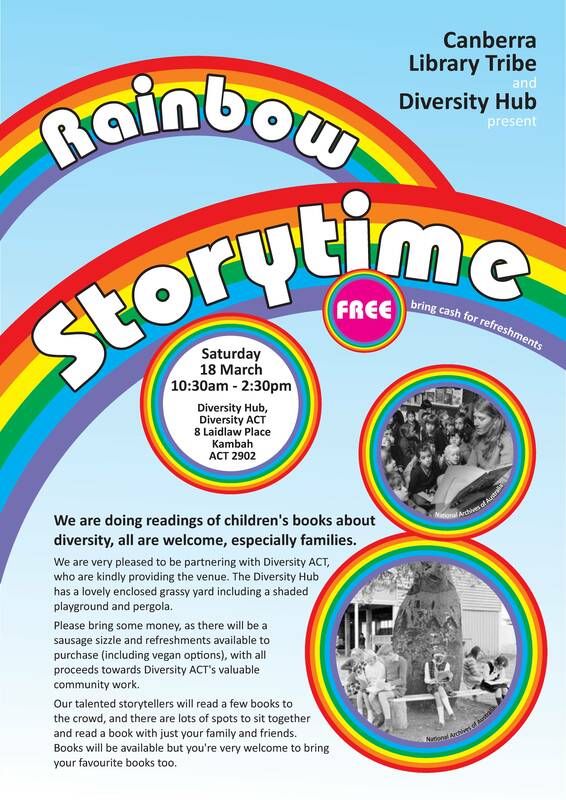 See you this Saturday for our Rainbow Storytime at Diversity Hub in Kambah! Don’t worry if the Weather Bureau thinks it will be cloudy – the playground and reading areas at the Hub are all under cover! Our official book-readers will start at 10:30 with a few stories, and then you can relax by choosing your own reading or have fun on the playground or enclosed lawns. Bring your favourite books, or try some of ours! RSVP for our Rainbow Storytime on facebook or eventbrite, or rock up on the day. It is free but we’ll be fundraising with a sausage sizzle (there will also be vegan options available). We are very grateful to CMDphotographics for making our stunning poster. 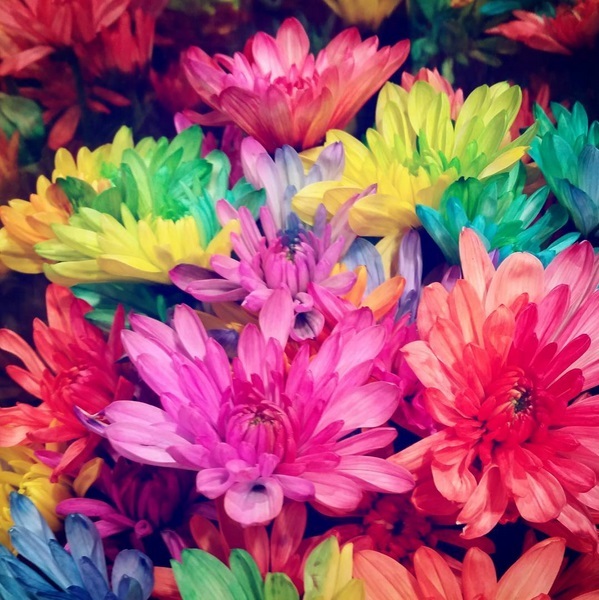 It makes us think of Rainbow Brite, nostalgia, books and sherbet! Everything you’d want in a Storytime. Thank you so much Carl! See you all at Rainbow Storytime! Posted on March 15, 2017 April 10, 2017 Categories EventTags families, family, LGBTI+, rainbow, rainbows, stories, storytime1 Comment on Rainbow Storytime on Saturday, whether rain, hail or shine! Excitement! Rainbow Storytime is this Saturday 18th of March! We are doing readings of children’s books about diversity, all are welcome, especially families. RSVP via facebook or eventbrite (or just rock up). 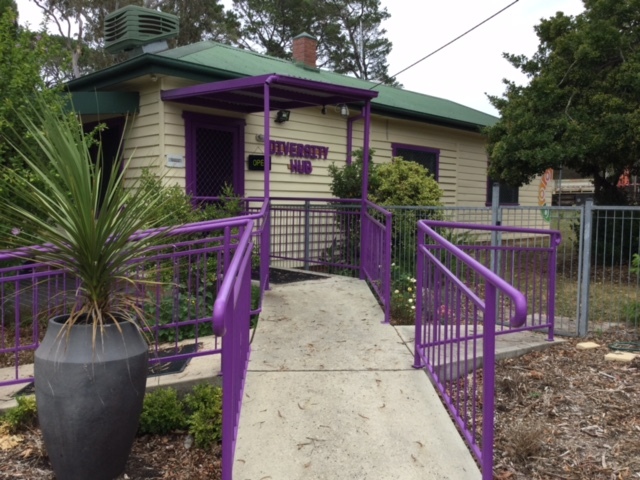 We are very pleased to be partnering with Diversity ACT, who are kindly providing the venue at Laidlaw Place, Kambah. The Diversity Hub has a lovely enclosed grassy yard including a shaded playground and pergola. Our talented storytellers will read a few books to the crowd, afterwards there are lots of spots to sit together and read a book with just your family and friends. Books will be available but you’re very welcome to bring your favourite books too. Please bring some money! While the event is free, there will be a sausage sizzle and refreshments available to purchase, with all proceeds towards Diversity ACT’s valuable community work. Posted on March 14, 2017 Categories EventTags Canberra, families, family, LGBTI+, rainbow, rainbows, stories, storytimeLeave a comment on Rainbow Storytime this Saturday! We’re pleased to share that tickets are now available for our next event, the Rainbow Storytime! See you on Saturday 18 March from 10:30am! Thanks for being patient with our Save the Date. Free tickets now available through eventbrite and facebook. We are doing readings of children’s books about diversity, all are welcome, especially families. It’s free but do bring some cash for sausage sizzle and drinks. All proceeds towards Diversity ACT’s valuable community work. We’re grateful for the beautiful venue from Diversity ACT. The Diversity Hub has a lovely enclosed grassy yard including a shaded playground and pergola. Posted on March 7, 2017 March 9, 2017 Categories EventTags Canberra, diversity, families, family, LGBTI+, rainbow, rainbows, storytimeLeave a comment on Rainbow Storytime tickets available! Free, but we’d love your RSVP! 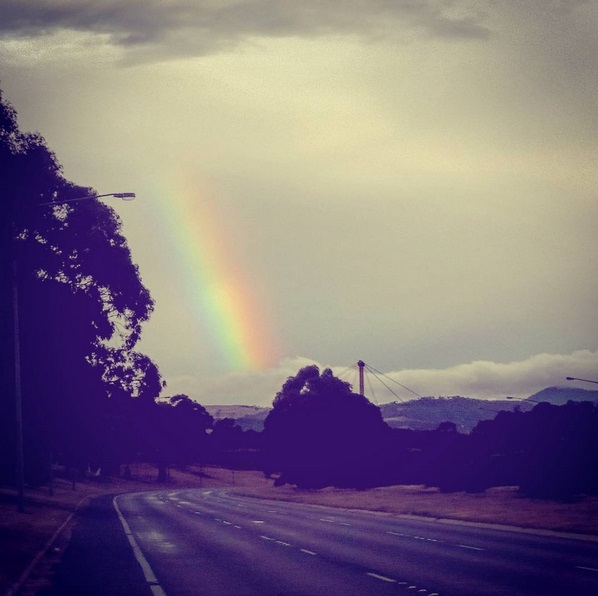 The Canberra Library Tribe delightfully announce our next event, a Rainbow Storytime. We are doing readings of children’s books about diversity, all are welcome, especially families. We are very pleased to be partnering with Diversity ACT, who are kindly providing the venue. The Diversity Hub has a lovely enclosed grassy yard including a shaded playground and pergola (you can’t see these areas in the photo, but trust us, they are amazing, verdant and delightful). Please bring some money, as there will be a sausage sizzle and refreshments available to purchase, with all proceeds towards Diversity ACT’s valuable community work. Date: Saturday 18 March, in the morning! Posted on March 2, 2017 Categories EventTags Canberra, diversity, families, family, LGBTI+, rainbow, rainbows, stories, storytime1 Comment on Rainbow Storytime, Save the Date for Saturday 18 March! Joye Volker, the Chief Librarian of the Research Library at the National Gallery of Australia retired in November 2016. 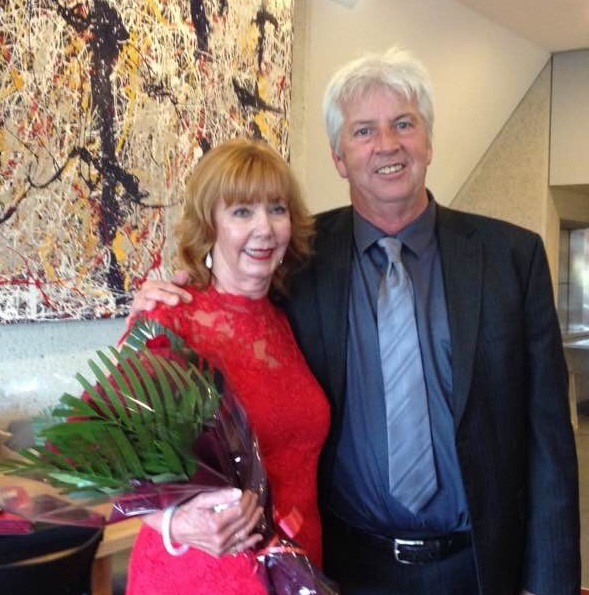 Joye was in the role for eleven years, leading Australia’s foremost art library and artist archives collection. “It has been my pleasure and privilege to work with so many of you. You are indeed inspiring colleagues. I have had such an adventure with you and my staff over the years, many who attended the champagne celebration at the Gallery. Joye Volker was farewelled by the Gallery on 21 November with a champagne celebration in the staff lounge, in front of a replica Blue Poles (copies of works of art were created by staff prior to the opening of the Gallery, to assist with planning and placement). My name is Aileen Weir, a good friend and former colleague of Joye, and it is my pleasure to say a few words this evening. As you know, Joye has been Chief Librarian here at the National Gallery since June 2005. She has loved being in this role and often refers to it as her ideal job. From my point of view, this role was the perfect culmination of a long and distinguished career. Joye is the embodiment of the position of Chief Librarian. She has a passion for art and librarianship and extensive managerial and strategic experience. When she joined the Gallery, she brought her well-established international connections to the role. She also brought a great sense of style and fun. I’m sure there is no one in the room who has not attended one of Joye’s celebratory events, always elegant, and, as tonight, accompanied by champagne. Given Joye’s passion for fine art, I’m sure there will be some in the room surprised to learn that her first qualification was an honours degree in pure mathematics and physics, a testament to her intellect. Joye obtained this degree in her native Canada after which, luckily for us, she decided to follow her mother’s advice and pursue a graduate degree in Library Science at the University of British Columbia. Joye’s professional career as a librarian began at the University of Calgary Library where, of course given her background, they quickly appointed her Science Librarian. Her colleagues at the University of Calgary soon recognised her potential and invited her to start a library for the new graduate program in the interdisciplinary study of environmental design. But, as one does when one is young and looking for adventure, Joye decided she was working too hard, resigned, hitch hiked across Canada and took a Polish ship to Copenhagen where she explored Europe for six months reconnecting with her Norwegian heritage and meeting many relatives. When she arrived in Copenhagen, she found a letter waiting for her saying she had achieved a National Research Council scholarship to complete a Masters in Librarianship at the University of British Columbia. So, this drew her back to Canada where she completed a thesis entitled “Environmental Design: An analysis of the field, its implications for libraries and a guide to the literature” A copy of her thesis resides in the University of Canberra Library so is still accessible right herein Canberra. More adventure beckoned and Joye left Canada again, this time to move to Australia and become Senior Librarian at the ANU. Her interest in artistic design, piqued in Canada, developed at the ANU where she helped build the art history collection with Sasha Grishin for the new Department of Fine Arts. It was in this role as Senior Librarian where Joye’s strengths as a manager began to emerge. As a single parent of twin boys, Joye was a strong advocate for work/life balance, not as easily obtained at that time. Margaret Cazabon, Marilyn Stretton, Joye Volker, Robyn McKay, Catherine Bohm amd Mary Anne Neilsen. She introduced job sharing to enable other young mums to juggle their family and professional lives. Many of these librarians became life long friends and went on to significant positions at the Parliamentary Library, ANU and elsewhere. Some, now retired, volunteer at the NGA as Guides convinced by Joye’s frequent raves about how fabulous it was to work here. In 1986, Joye achieved the position as Librarian at the Canberra School of Art at the ANU, a position she held and loved for 17 years. Joye blossomed in this creative atmosphere, admiring the talented students and it was at the School of Art that Joye’s strengths and reputation as a leading art librarian really took hold. She embraced the role, frequently publishing papers and presenting internationally. One of her first presentations was in Stockholm for the International Federation of Library Associations Art Library Section. Given the lucky timeslot of 5pm on a Friday afternoon, Joye knew she had to be entertaining and her presentation entitled “Kangaroo Kitsch: the iconography of design in Australia” captured her audience with its striking visual imagery. Joye soon established herself internationally, becoming the Australian representative on the Standing Committee of the Art Library Section of International Federation of Library Associations (IFLA). Joye continued to represent the region in the coming years, giving presentations at IFLA conferences held in Bangkok and Quebec. 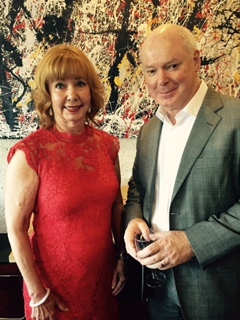 Other international presentations include the work she co-authored with ANU art history Professor Greenhalgh called “Australia, Images and the Internet” presented in San Antonio, Texas and “The Image Down Under: Collaborative ventures in the visual arts, music and architecture in Australia and New Zealand” presented in New York. Joye was always on the forefront of the digital age, contributing to the international development of the Dublin Core standards and creation of metadata applied to web publications. She was active in the field of copyright of images and received numerous study grants over the years including from the Getty Museum, a Paris bookshop, ANU, Visual Resources Association and the Research Libraries Group based in the US. 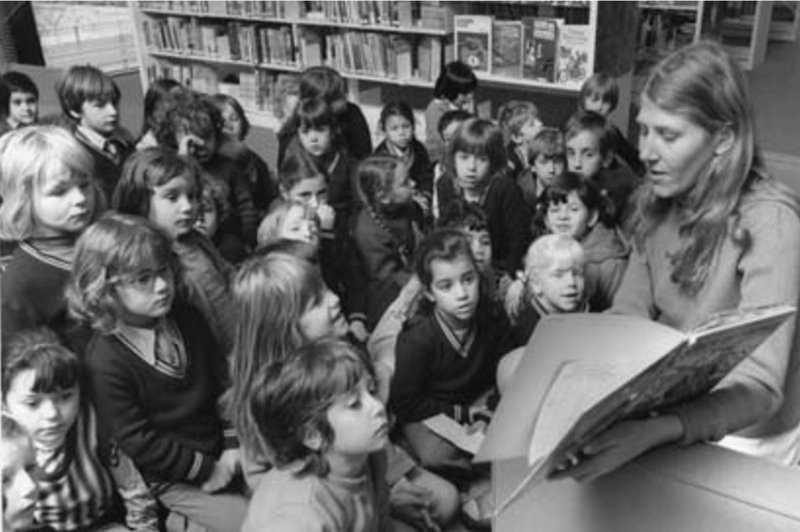 Joye was also active in professional life domestically, becoming President of the Arts Libraries Society, ANZ, as well as Chair of the ACT Branch of the Australian Library and Information Association, our profession’s peak body. Joye’s leadership also left a lasting legacy at the ANU. In 1987 the Schools of Music and Art were brought together to become the National Institute of the Arts and Joye became the Institute Librarian. Joye was responsible for establishing the first Infolab on campus at the Art Library, officially opened by the Vice Chancellor and bringing state of the art equipment to her. Working with Robyn Holmes at the School of Music, Joye contributed to the National Networked Facility for Research into Australian Music (NFRAM) in 1999. This project was a partnership with three other universities, the NLA, NFSA and the Australian Music Centre and attracted the largest ARC research infrastructure grant awarded in the arts to that date. Ultimately this led to the development of Music Australia at the NLA, still accessible through Trove. After joining the NGA, Joye continued her international and national leadership in the field of art librarianship. The Gallery library has become the finest art research library in the country, with a collection valued at 37 million dollars, half of which is unique material. The fully catalogued Archives and Artist Files have been thriving and are now discoverable by researchers around the world through the OCLC Art Library Discovery Catalogue operated out of the USA. Like every good library, the collection and space has enabled new creative output. And many NGA exhibition catalogues would not have been so excellent without the Research Library. Of course, Joye has many interests outside of work as well. Earlier I briefly mentioned her twin boys, Aaron and Sam. Since their arrival in the world in 1981, Joye’s boys have been the core and centre of her life. Both are now very successful in their own right. Sam is a Senior Accountant in Melbourne and Aaron is working in law and accounting in Zurich Switzerland. I understand she is flying to Switzerland in December to visit Aaron and his fiancée Natascha to once again experience a North American winter and explore the Christmas Night Markets in Germany and France. Joye closely identified with the Norwegian practice of ‘hygge’ (hoogah) – which means embracing the coziness of winter and enjoying the outdoors of summer. Joye has always been active, competing internationally in the sport of orienteering in far away places such as the highlands of Scotland and Tasmania. 15 years ago she took up golf at the Royal Canberra, playing with the Business Ladies on Sundays. This sport, however, has brought something much more important to her life. It was through golf that Joye met her lovely partner Chris, a champion golfer himself, enjoying a shared pastime that has brought them both many trophies. They are now winning trophies in another field as well as Chris and Joye are part owners of a racehorse, named Akiko Gold. As you might expect, Akiko Gold is an elegant, dainty little filly, who has already won three races and placed in others. Joye’s generosity and thoughtfulness are renowned. She throws terrific parties, is a fabulous hostess and a great cook. She inherited this from her mother who, as a preacher’s wife, entertained anyone who didn’t have a special place to go following the Sunday morning sermons. Joye is a PK as they say in Canada – a Preacher’s kid – and the values and generous spirit she gained from this religious upbringing permeate everything today. “Congratulations on your brilliant career. 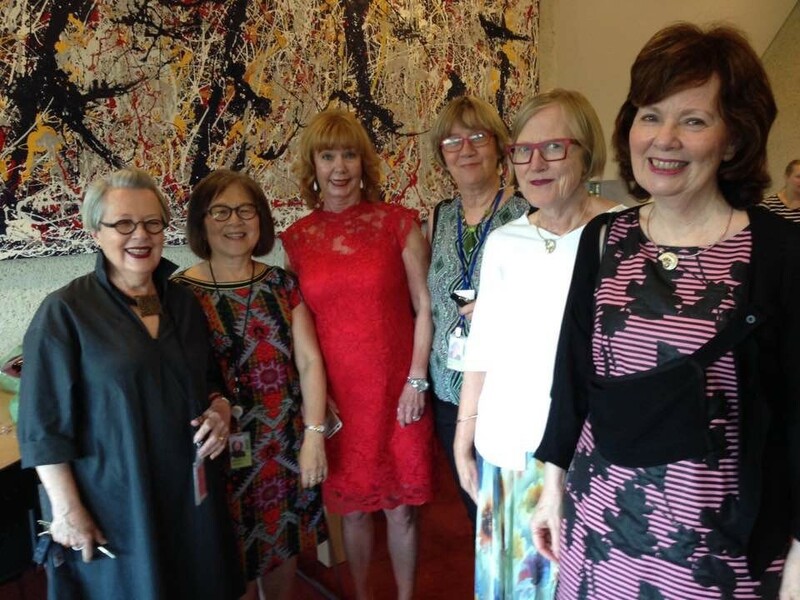 You have made outstanding contributions to libraries in Canberra, to the professional association ALIA, and to art libraries throughout the world particularly through your work with IFLA. You have been a guide and mentor to many and a truly exceptional professional colleague. Your personal warmth, charm, intellectual capacity, thoughtfulness, passion and style have enriched occasions and events and won you friends everywhere. For all who have worked with you, let alone passed by, you will remain long in their memories. Best wishes for the next steps on life’s journey. Felicitions et bon voyage.” – Janine. Joye adds to all of our lives. Her favourite colour is red which, according to one of the pop psychology sites, defines her as extroverted and optimistic, courageous and confident, action oriented and physically active. You are stimulating to be with and you radiate a great deal of energy. You are achievement-oriented and gain the respect of others easily with your practical and grounded attitude and ability to set boundaries. Lovers of red are the explorers and pioneers of the world and have a passion and enthusiasm for life. Says it all really. Please join me by raising a glass to acknowledge Joye’s world-class career, her significant accomplishments, her fantastic sense of elegant style and her warmth and generosity as a human being. To Joye.